It's hard enough around here when we have to find a present for a child's birthday with all of the options out there, but oftentimes it seems even more difficult when it is an adult that we're celebrating. It's not like I can find out what characters or games they like and head to the store to find something in that category (unless they happen to have a collection of Sesame Street paraphernalia, but that isn't too common). But coming up with a gift idea that would please just about anyone - men and women of any age - just doesn't seem possible. Or at least, didn't seem possible. Not until I was introduced to the unique, creative, high quality Birthday Gift Baskets from ProFlowers. Connecting consumers with fresh-from-the-field flowers since 1998, ProFlowers is known for their hand-picked, high quality, beautiful bouquets that will bring a smile and brighten any recipient's day. But little did I know that they had such great Birthday Gift Baskets, with everything from fruit and snacks to wine to spa products. With delivery available every day (except Sundays and major holidays), the hardest part about ordering a Birthday Gift Basket is selecting between the fun options. With a family gathering for my Father-in-Law's birthday only days away, I finally decided on the Deluxe Snack Attack as the perfect gift. I was slightly worried that it wouldn't get there in time for the celebration, but found that I had no reason to even be concerned when I heard word that it had been delivered the very next morning. Who could wait to dig right in to this tasty assortment of munchies? With a flavorful option to satisfy everyone's cravings, the Deluxe Snack Attack included nine different 6-oz packages of things like roasted salted almonds and cashew, honey sesame sticks and classic corn nuts. A snack-lover at heart (my husband is the same way), my Father-in-Law was not only surprised but eager to check out all of the varieties found in this basket. 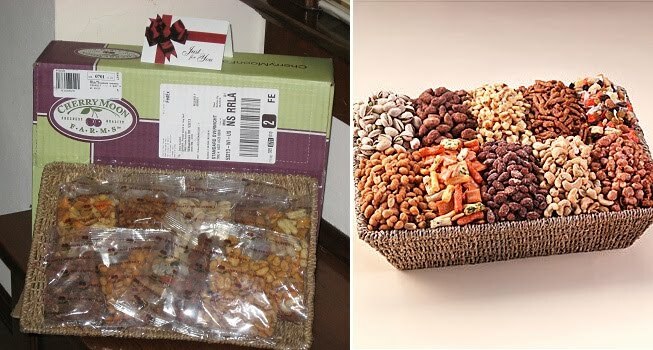 As each packet was individually wrapped, his first impression (after heading straight for the pistachios) was how fresh and delicious the nuts were - which is definitely an important factor when sending a basket that includes food! No one wants to send a stale present and as ProFlowers has gift baskets that include all sorts of fruit, nuts, cheeses, sausages, mustards and more, you can rest assured that they will always arrive tasting great. With options customized for pampering, sports enthusiasts or chocolate lovers, just to name a few, for your next celebration, ProFlowers has the Birthday Gift Basket for everyone - and how convenient that in a few clicks your shopping will not only be finished but delivered for you! Birthday Gift Basket (up to $75) from ProFlowers! To enter to win: Browse the selection of Birthday Gift Baskets from ProFlowers and tell me which one is your favorite. 1 Extra Entry if you tell me the name of a bouquet or plant that you would love to send or receive from ProFlowers. 3 Extra Entries if you blog about this giveaway linking back to Thanks, Mail Carrier and ProFlowers. Please leave an address where it can be found. A big thank you to ProFlowers for providing a Deluxe Snack Attack basket for me to review as well as a Birthday Gift Basket of choice for one lucky giveaway winner. The opinions shared are my own and honest and if you really need to see more, click here to see how I roll. I like the "Spa Treat"
I'm between the Ghiradelli chocolate basket and the Movie bucket one! 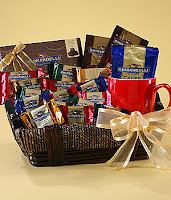 Ghirardelli Chocolate Basket is what I would get from the birthday choices! My favorite is the Ghirardelli Chocolate Basket. I would like to get assorted roses! I'd love to send the Colorful Gerbera Daisies bouquet to my wife! Gourmet indulgence is my fav. I love that large Kaleidoscope orchid! I would love to receive the Cheers Gift Basket. I'm a chocoholic, so the Ghiradelli chocolate basket would be my first choice! The Potted Double Stem Kaleidoscope Orchid is gorgeous! I'd love to send my mom the Azalea Bonsai. She would love it. They all look wonderful. But I would choose "Cheers". The Beary Happy Birthday Tray looks fun! Potted Pink Calla Lily is very cute! I like the Lavender Relaxation Spa basket the most. The Movie Night Birthday Gift Basket is my favorite. The Sunshine Sweets & Savories is my favorite. A bouquet I would love to send is the Gerbera Daisies. I entered the 1800Flowers giveaway. I entered the William Riera giveaway. I entered the Pear Tree Greetings giveaway. I entered the JewelryPayless giveaway. My favorite is "Movie Night!" A flower I'd like to send is the 7 Stalks of Lucky Bamboo in Glass Vase. Deluxe lavendar relaxation spa package!! I like the Gourmet Indulgence Gift Basket. The Beary Happy Birthday Box is my favorite since I collect bears! Mrs. Fields Birthday Bites Looks yummy. I would send the Lavender Relaxation Spa basket to my mom.